This fruit cake (Obstkuchen) is made with egg-weight-dough. You can increase/decrease the cake size depending on your needs or the size of your springform pan. Simply add/remove one or two eggs and easily adjust your ingredients according to the new egg weight thus the name "egg-weight-dough". Make it with apples, apricots, cherries, plums or rhubarb. Picture shows fruit cake made with apples and a merengue topping. Prepare the Egg-Weight-Dough (Eischwerteig) according to the basic recipe, make it from 3 eggs. Butter the 24 cm (9") springform pan. If preparing cake with merengue (Haube) topping use a larger springform pan (30 cm or 12") because the cake will have more room to grow in the larger springform pan. Preheat oven to 175°C/340°F. Prepare the fruit (see below) depending on the fuit chosen. Bake on middle rack for 35 minutes at 175°C/340°F then increase oven temperature to 180°C/355°F and bake for another 10 minutes or until an inserted toothpick comes out clean. 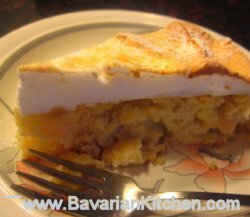 If you chose to make the cake with the merengue topping (recommended but not necessary) bake the cake for 35 minutes at 175°C/340°F then remove cake from oven, spread the whisked egg whites evenly on the cake and bake at 180°C/355°F for another 10 minutes. Remove the cake from the oven and let cool a little then remove from the springform by running a knife along the edge of the form. Dust powdered sugar (optional) on the completely cooled cake for cake with no merengue topping. Peel the apples, remove core. Slice and cut into small inch cubes, place apples in a bowl then sprinkle with lemon juice and some sugar, mix. Wash the apricots, cut in half, remove the pit, dry with paper towels and slice into sections or small cubes. Wash the cherries or sour cherries, remove the stem, drain very well, do not remove the pit (unless you use cherries from a jar which are usually without the pit). Wash the rhubarb, remove outer skin on older rhubarb, cut into 3cm / 1" long sections. Wash the plums, cut in half, remove pit, dry with paper towels. When making the cake with apples, pour the dough into the bowl with the apples and mix until apples are well coated with the dough. It may look as if there isn't enough dough but there is. If making cake with any of the other fruit, pour the dough into a buttered and floured springform pan. Arrange the fruit on top of the dough pressing them lightly into the dough. Seperate the eggs carefully. Add the egg whites to a clean bowl. Whisk the egg whites adding the sugar and lemon juice towards the end gradually and continue whisking until the egg whites are stiffened. Tip: best when served warm or reheat a slice of cake later in a microwave for 10 seconds.